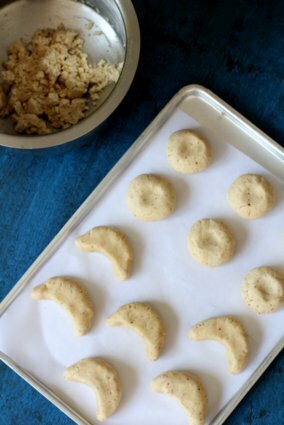 Kourabiedes (kou-ra-bi-ETH-es) are festive, shortbread textured, Greek butter cookies loaded with almond goodness. 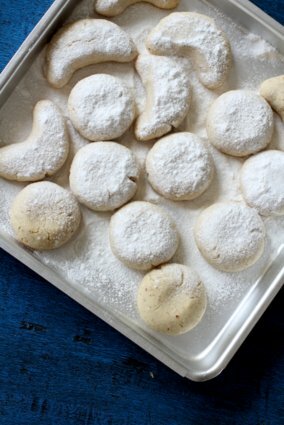 Similar to snowballs, these baked greek biscuits are laced with a hint of clove, pure rose water and coated with powdered sugar. In Greece, no festive spread is complete without a platter of kourabiedes during Christmas and New Year’s celebrations. 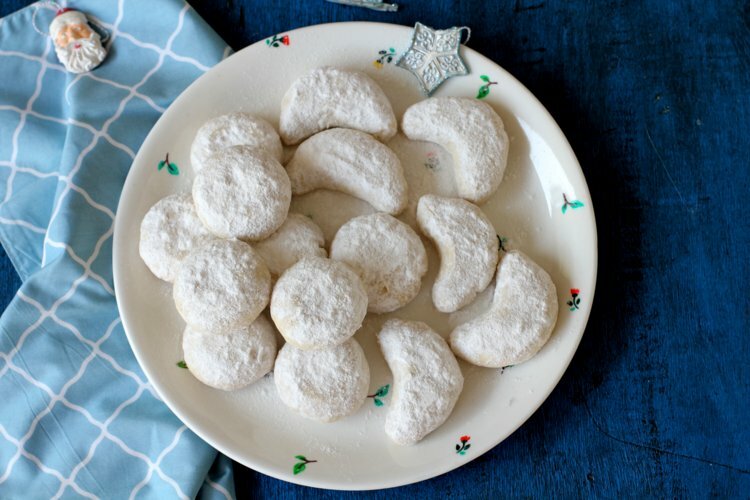 These greek butter cookies are light, buttery, not too sweet and have a crumbly texture. 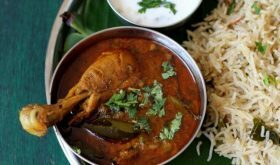 They are usually shaped into crescents (moon shape) or round flattened balls with indents on top. The authentic kourabiedes recipe calls for the use of egg, cognac or brandy and pure rose water. Once the cookies are baked, they are sprayed with rose water and then dusted in generous amount of powdered sugar. 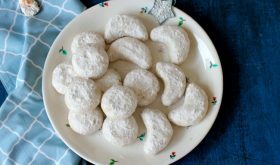 I have made an eggless version of greek butter cookies. If you do not have edible rose water on hand, you can omit it. 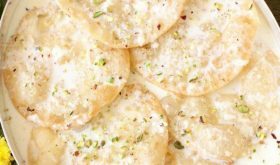 Do add lemon zest as they give a lovely citrus flavor to the greek butter cookies. Ensure that you roast the almonds well, cool and then grind them to a fine powder. 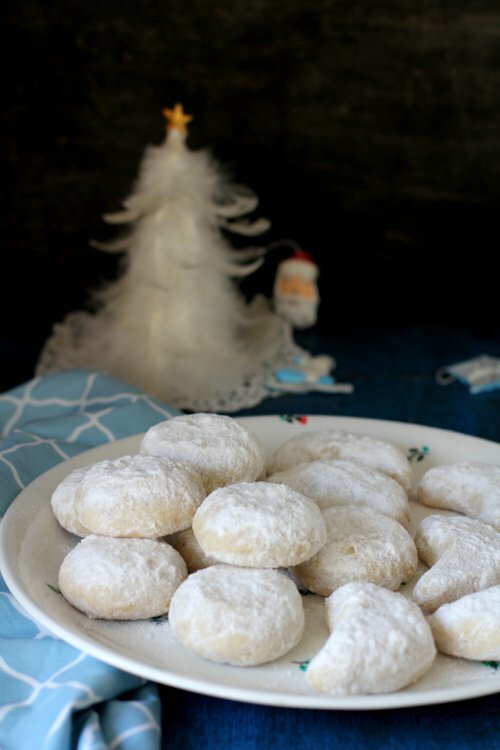 Absolutely easy to make, light Christmas butter cookies that are soft, crumbly and addictive. Kids love them and so do adults. 🙂 Kourabiedes are a must have Christmas treat in Greece. 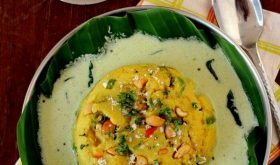 In a bowl, sift the flour, baking powder and salt and set aside. In a bowl, cream the softened butter for 3 mts until light and airy. Add the icing sugar and beat for another 4-5 mts. Add vanilla extract, lemon zest, rose water and clove powder and mix well. Add the almond powder and mix till well combined. Finally add the flour in two batches and mix with a wooden spoon. Do not over beat or mix the mixture. You will have a soft dough. Refrigerate the soft dough for 15 mts. Shape the dough into small flattened balls. Make a small indent in the middle of each ball using your thumb. OR you shape the dough into moon shaped crescents as shown in the image above. Place them in a parchment lined cookie sheet/tray. Again refrigerate the shaped cookies in the oven for 15 mts while you pre-heat the oven at 175 C.
Bake the cookies in the pre-heated oven for 15-18 mts. They will be soft on touch and will be pale in color and will not turn golden. Remove from oven when they are just beginning to change color. In a wide plate, add some icing sugar and place the warm cookies. Dust them with more powdered sugar till it coats well. Remember to dust the cookies when they are hot off the oven as the sugar will coat well when the cookies are warm. 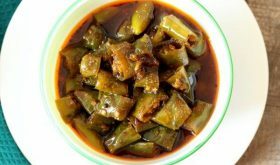 Place in an airtight container and they stay good for at least a week. You can flavor the dough with just vanilla extract and lemon zest if you do not have clove powder or pure rose water on hand. After adding the flour to the mixture, do not overmix or over beat. Just mix till there are not traces of flour. Dust the cookies as soon as they are out of the oven as the powdered sugar will coat well. If you do not have almonds, you can use walnuts. You can freeze the dough for a couple of weeks and make cookies by thawing the dough. 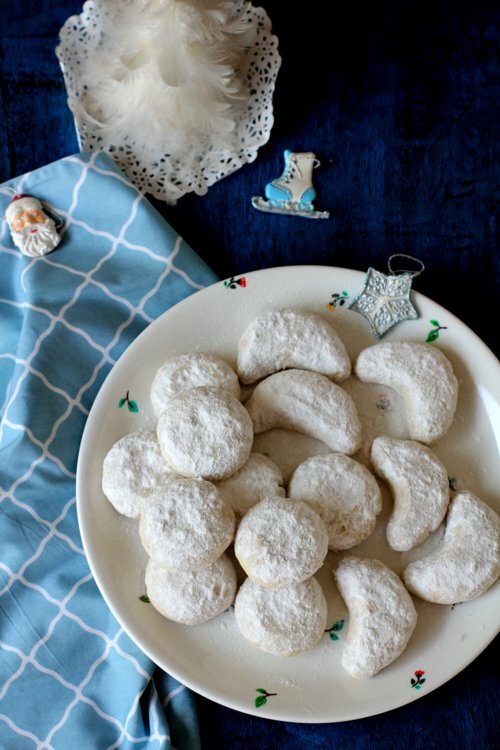 By Sailu Published: December 25, 2015 Kourabiedes recipe, greek butter cookies that are eggless, light & coated in icing sugar. Greek biscuits are festive treats made for Christmas & New Year's.